Although you are in the kitchen, get dressed like a typical flamenco lady. A wide range of original aprons, highly flamenco stylish. 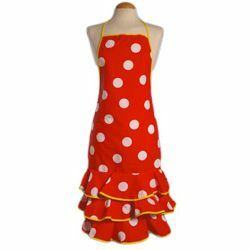 With this apron you will be able to dance ''sevillanas'' or ''rumbas'' while cooking. Made with a polka dot pattern with three small ruffles from the same material and finished with a vivid colour ending. It has a strip round the neck and two strips to tie it round the waist.